This shadow box was created in honor of a Holocaust victim named Olga Gelb. 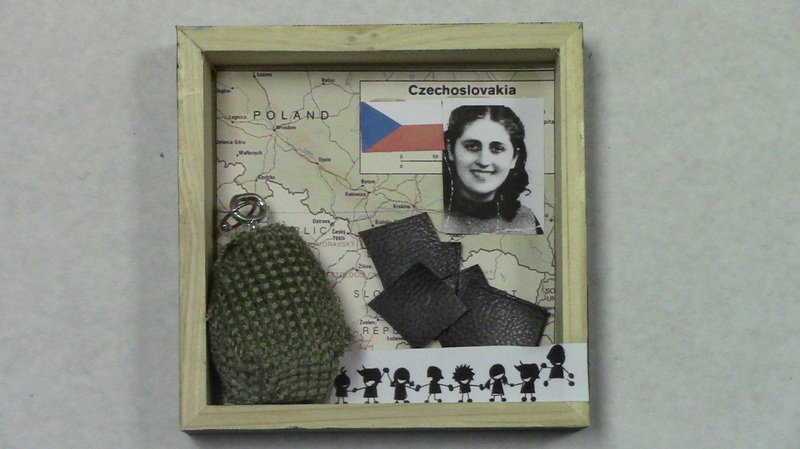 There are multiple objects in the shadow box that describe Olga or certain events in her life. The picture of her next to a Czechoslovakian flag shows she was born in Czechoslovakia. There is also a map of Czechoslovakia as the background of the box. The squares of leather show that her father worked as a wholesale leather merchant. I also created a grenade which represents what she worked on in the camps. Her job was to fix grenades, but she continued to sabotage and let faulty grenades through. Lastly, I there is a picture of eight kids holding hands. That represents the eight children in her family, including her. Olga and and all of her friends agreed they had to do something. They couldn’t just stay silent and give in. “Our Kapo shouldn’t be able to control us any longer,” they thought. She had been abusing her relationship with an SS officer. She would beat them with sticks and rocks while he watched in amusement. Olga and her friends came up with a malicious plan to get rid of her. They gathered a blanket and large rock. Since it was Sunday, they traveled to her usual spot where she laid out to sunbathe. They grabbed the rock and the blanket, sneaking up behind her. They quickly threw the blanket over her face and pounced on her with the large rock continuously beating her head in as she struggled to resist. Eventually they finished the final blow, and her body lay limp. Though they committed such a crime, they never received any punishment. Since the Kapo was a Jew and she had had sexual relations with a German, Olga and her friends were not penalized. Long before these events on January 26, 1925. Olga Gelb was born in the small town of Khust, Czechoslovakia. She was born into a successful household where both Hungarian and Yiddish were spoken. She was one of eight children and attended both a public school and a Hebrew all girls’ school. When Khust was under Czech rule, Olga could worship any religion she wanted to and not worry about being discriminated against in school. Then Czechoslovakia came under the control of Hungary. Eventually, her Czech teachers were replaced by Hungarian ones. She left school at the age of fourteen because of anti-Semitism. Her father was also eventually forced to sell his leather business to a Hungarian. Olga was first affected by the Holocaust in 1944 when she was deported to Auschwitz. She and all the other people in her town were crammed into small boxcars. The trip took a long time, and people were screaming and crying the whole way there. When she arrived in Auschwitz, people were split up into two lines. She was sent to the left and immediately put to work. She was assigned the job of assembling hand grenades. She and the friends who were working with her sabotaged the project and let faulty grenades pass through. With very little to eat and back breaking work every day, life in Auschwitz was very long and intense. Mealtimes and bedtime were the best parts of their days. Eventually Olga was transferred to a concentration camp called Ravensbruck in 1945. It was an all girls’ camp. The conditions there were very harsh, with diseases being passed around and people sleeping on floors. She stayed there for four months until she was liberated by Russian troops close to Berlin in April, 1945. She eventually emigrated to America in 1949. The Holocaust changed many lives in Europe, not just Olga’s. Many people were taken out of their homes and only a small percentage survived. The only way to make it through the Holocaust was to work hard and stay healthy. Olga was able to please the Nazis and stay alive until she was rescued. Many people were not as lucky as she and were tortured or instantly killed. She is one of the small percent of people to escape the holocaust. We do these kinds of projects to honor and remember the people of the Holocaust.